Bernard Ženko is research fellow at the Jozef Stefan Institute, Department of Knowledge Technologies. His reserch interest includes machine learning, rule learning, predictive clustering, ensemble methods. Bernard will make an introduction course to konwledge technologies and datamining and will have lectures from some of the most used techniques and processes from dataminig. Angelo Di Iorio is a research fellow at the Department of Computer Science and Engineering (DISI) of the University of Bologna. He holds a Ph.D. in Computer Science. His PhD thesis covers markup languages and document engineering areas, being focused on design patterns for digital documents and automatic processes of analysis and segmentation. His research interests also include: pagination and sophisticated templating, simplified authoring and publishing processes, collaborative editing, versioning and diff-ing techniques, metadata and automatic generation of semantic annotations. Maurizio Pighin and Anna Marzona are professor at University of Udine in Department of Mathematics and Computer Science. Their reserach interest covers areas of bussnies informatics, knowledge technologies and datamining as reserch in unlearning and relearning in processes of business information systems and innovation. Their courses will cover area of bussnines information systems, innovation and datamining proccesses. Markus Schatten is reseraher at Faculty of Organisation and Informatics at University of Zagreb. His reserach interest are semantic web, knowledge discovery, machine learning and natural language processing. Ingo Mierswa is the founder of Rapid-I and CEO of Rapid-I Germany. He has several years of experience in project management, human resources management, consulting, and leadership including ten years of coordinating and leading the multi-national RapidMiner developer team with about 50 developers and contributors world-wide. Simon Fischer is Head of Research and Development at Rapid-I. He is one of the initiators of the RapidMiner project started in 2001 which has by now, together with the data mining server RapidAnalytics, become the number one open source data mining solution. 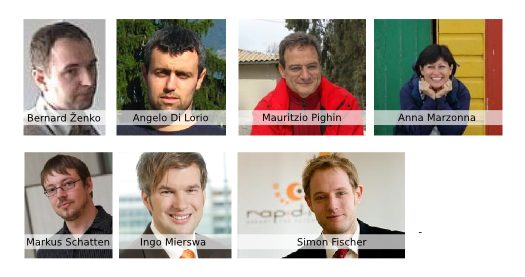 Simon Fischer leads the development of the Rapid-I product suite and coordinates various research projects at Rapid-I. RapidMiner is today the world-leading open-source system for data mining. It is available as a stand-alone application for data analysis and as a data mining engine which can be integrated into own products. By now, thousands of applications of RapidMiner in more than 40 countries give their users a competitive edge.